This week the Oakland A’s proved everyone from the concessions stand operator to the Commissioner of Baseball wrong. They didn’t have the big salaries. They didn’t have the big name players. They didn’t have the owners behind them. Yet, somehow they kept winning and winning. They played hard and eventually, they caught up to the Texas Rangers. With the stuff that makes great sports movies, on the final day of the season, they beat the Rangers and took the division. I couldn’t help but think about my Dad as this all unfolded. I don’t think there was a bigger A’s fan than my Dad. He started following them when they moved to the Bay Area in 1968. He cheered them through the pennant seasons in the 1970s. He loved Joe Rudi, Sal Bando, and Catfish Hunter. He stuck around when Charlie Finlay trade one great player after another. He was there when they came back to prominence in the 1980s. He was a big fan of Dave Kingman, Mike Gallegos, and Rickey Henderson. He stayed with the team throughout the 1990s. When all that was left was the fun the young player seemed to have on the field, he kept following them. He watched them in the 2000s through the playoff years and through the steroid scandals. He had his Baseball Digest with him his last two weeks of life when he was in the hospital. My Dad passed away in 2010. When I think of him, I think of baseball. There wasn’t a day from April to October that the A’s weren’t on the radio or on TV. That’s one of the things he and I shared together. We both loved baseball and in the evening, we’d have the TV on and argue over plays. This is my Dad’s A’s hat. It holds pins from different games that he went to. These were the special pins, the ones that made it to the hat. He wore this hat to every A’s game. He had a matching A’s jacket and t-shirt, too. No one was going to mistake him for a Giants fan! The last two years of his life, his emphysema got bad. He wasn’t able to go to the games anymore. I had hoped in those months the A’s would bring him some joy, but they only made him more frustrated as they put up one losing season after another. 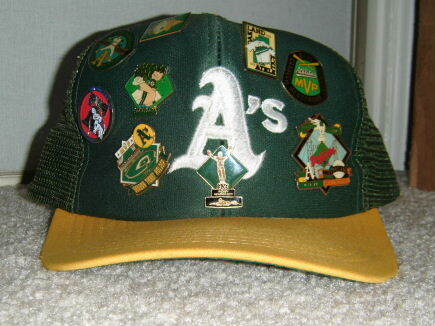 This pin may sum up how my Dad felt about baseball and the A’s. This pin was handed out when Rickey Henderson broke the stolen base record. The pin commemorated that amazing feat. My Dad loved Rickey. He thought Rickey was one of the greatest players who ever set foot on a baseball field. 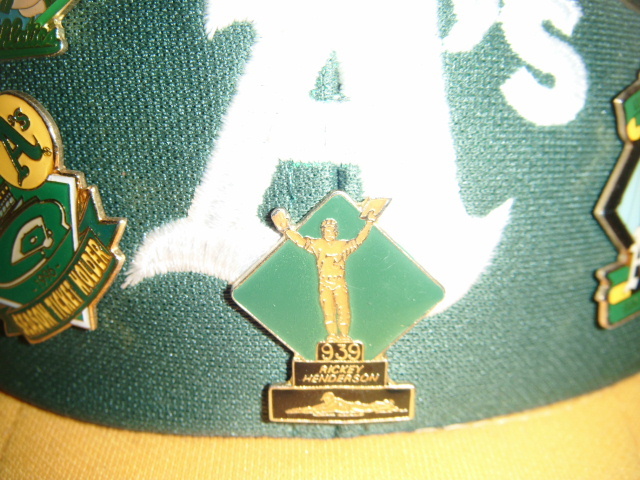 This pin always sat in the center of his hat right below the A’s logo. That was the place of honor and no other pin ever replaced it. After my Dad died, we divided up his things. The only thing I took was a couple of his collector cars and his baseball hat. Of all the things he had, the hat reminded me the most of him. I can still remember him sitting in his recliner with a piece of wood on his lap. That was his makeshift table. His pins were spread before him and he painstakingly shifted them around to make room for a new one. I’ve left all the pins exactly how they were the day my Dad died. It seems that that is the way they should be. So, as I listened to the last game of the season as the A’s clobbered the Rangers, I couldn’t help but think of my Dad. I wish he could have taken part in their victory. He would have relished the fact that they were underpaid and that the underdogs. He would have mocked Lew Wolf for claiming that the A’s couldn’t win in Oakland. I hope wherever his spirit may lay he was waving a pennant and cheering just as loudly as we were when the final pitch crossed the plate. This season was for you, Dad!